Following a major accident near Moscow in which 18 people were killed, the deputies of the State Duma now intend to hasten the entry into force of a law that obliges foreign nationals wishing to work in Russia to obtain Russian driver's licenses. “Amendments to Article 20 of the Law on Road Traffic Safety oblige foreign citizens wishing to work in the Russian Federation—in commercial services or as employees—to obtain Russian driver's licenses. These amendments shall enter into force on November 1, 2013,” said the head of the Duma's Transport Committee, Yevgeny Moskvichev of the United Russia party. According to him, in order for foreigners who are already working in the transportation sector in Russia to obtain a Russian license, they will have to pass a test demonstrating their knowledge of traffic rules; those not employed as drivers will also have to pass a practical examination. “It is already possible to obtain Russian licenses. The rules of the game are already spelled out. Come and get yours,” said the parliamentarian. Moskvichev clarified that these new amendments do not apply to transit carriers: In those cases, transportation is carried out in accordance with international rules. The reason for the new debate on tightening requirements for foreign drivers was another major traffic accident. On Saturday, July 13, a truck driven by a citizen of Armenia who previously had been fined many times for serious traffic violations hit a passenger bus. As a result, 18 people were killed and dozens were injured. 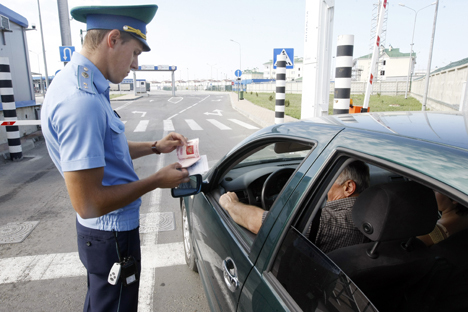 The first deputy chairman of the State Duma Transport Committee, Mikhail Bryachak, explained that the relevant law concerning the obligatory possession by foreign citizens of a Russian driver’s license was adopted in the spring. The law is set to come into force one year from its adoption, but parliamentarians believe that this is too long. “In autumn we will consider implementing these amendments even earlier,” said Bryachak, in an appearance at the Kommersant FM radio station. “Secondly, there are different republics, different climatic zones and different geographical landscape components. There are republics that do not know what snow, ice and winter conditions are. This must be taken into account,” said Bryachak. Nevertheless, some experts believe that legislative measures alone are not enough to reduce the number of accidents. According to them, it is necessary to punish the owners of transport companies that force people to work to the limit of their physical capacity; the road network and the efficiency of the traffic police must be improved, as well. “These tragedies happen not because the drivers do not know the rules. There are many reasons. Primarily, it is the sweatshop system, which makes drivers overwork themselves. They are simply told that, the more trips they run, the more money they will receive. It is clear that such a system is generated by the employers themselves,” Viktor Travin, president of the Collegium for the Legal Protection of Car Owners, told RBTH.